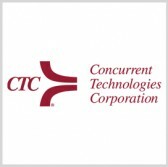 Concurrent Technologies Corp. has opened an office in Crystal City in Arlington, Virginia, as part of a push to bring the nonprofit applied scientific research and development firm’s employees closer to Defense Department customers. CTC said Monday 14 of its employees work daily from the new office and another 25 personnel conduct business at the facility. Bob Kubler, senior director of readiness and training at CTC, said the company can host client meetings at the Crystal City office. “Not only does the building have better accommodations, but the location is much more convenient for travel to and from our clients in the D.C. area,” Kubler added. CTC noted the office building features a conference center and multiple conference rooms. The new company office is located at 1235 South Clark Street, Suite 715. Tags: ArlingtonBob KublerConcurrent Technologies Corp.Crystal CityCTCDefense DepartmentDODGovconVirginiaWashington D.C.